Are you looking for a branding book that's a bit different? You've found it. 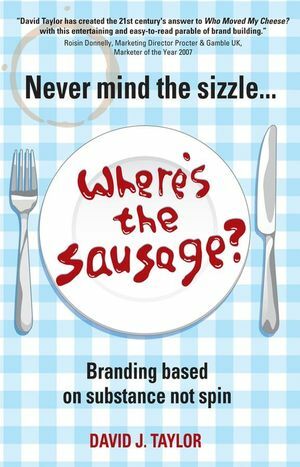 Never Mind the Sizzle... is an irreverent story packed full of practical tips, tricks and tools that reveal how to cut through the bull and buzzwords of branding, get deep insight into your customers, create a big brand idea, get your boss on board, win the consumer's heart and mind and stand out from the crowd. Join the blog at wheresthesausage.com ! David Taylor is one of the world's 50 most important marketing thinkers’ according to the CIM. He is the author of three books on branding published by John Wiley: The brandgym, Brand Stretch and brand vision. David is the founder and Managing Partner of the brandgym, a consultancy that coaches teams to create a clear brand vision and the action plan to turn this into growth. He has led brand vision projects for many top brands including Hellmann's, T-Mobile, Persil and Bertolli. QUARTER ONE: Branding for business. 1. January – The buzzword battle begins. 2. February – Brand-led business. 3. March – Elastic brands. QUARTER TWO: From insight to brand vision. 4. April – Be the consumer. 5. May – GPS for your brand. 6. June – Brand trampoline. QUARTER THREE: Test-driving the vision. 7. July – Show them the money. 8. August – Consumer test drive. 9. September – Don’t just think different, do different. QUARTER FOUR: The rubber hits the road. 10. October – Rallying the troops. 11. November – Making money, not movies. 12. December – The sausage has landed.